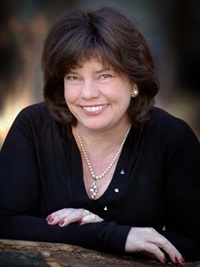 Kathryn Rossi, Ph.D, is a licensed psychologist and certified yoga instructor (RYT 500). 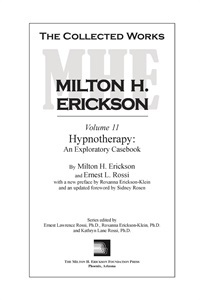 She recently co-edited the 16-volume Collected Works of Milton H. Erickson. 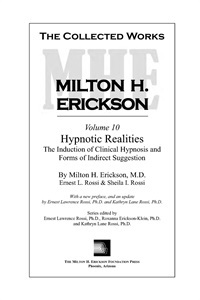 She and Ernest Rossi are in private practice in Los Osos, Calif.
Eleventh volume of Erickson's Collected Works contains Erickson's ideas on the nature of hypnosis and hypnotic therapy. Twelfth volume of Erickson's Collected Works containing two-level communication, the naturalistic approach, and the utilization approach. 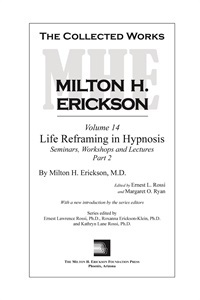 Fourth volume of Erickson's Collected Works contains a biographical chapter on Milton Erickson, revealing the many important events of his life that contributed to the development of his ideas. 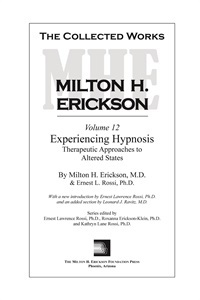 Fourteenth volume of Erickson's Collected Works containing approaches to hypnosis and psychotherapy.